The Environmental Protection Agency said Wednesday that based on its initial toxicity tests, it is not recommending any changes right now to BP’s use of the dispersant Corexit 9500 to break up oil in the Gulf of Mexico. EPA researchers tested the dispersants on a small fish called the inland silverside and on a type of shrimp called the Gulf mysid, both common toxicity test subjects that are also native to the Gulf. Paul Anastas, the EPA’s assistant administrator for research and development, told reporters that the decision to use dispersants was “difficult” but that it was appropriate for the spill. 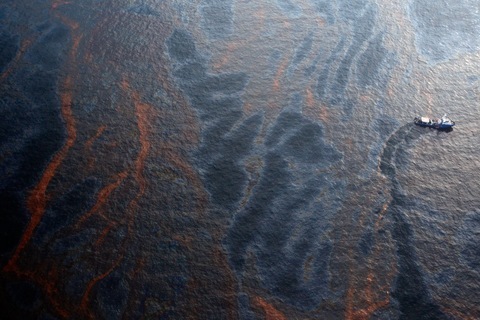 But the use of dispersants has generated controversy since the beginning of the spill. In May, EPA asked BP to scale back its use of the chemical and to identify a less toxic alternative. When BP reported back that it was unable to find a less toxic alternative, EPA said that it would conduct its own tests. Anastas also said that BP had reduced its dispersant use by 70 percent since the May directive. But the Miami Herald reported this week that BP has continued to exceed the recommended 15,000-gallon daily limit. Many scientists are worried not only about the direct effects of the dispersant itself, but also about its effects when mixed with oil. The initial results released Wednesday didn’t address that issue. Anastas said EPA is conducting those tests now and hopes to finish them in the next week. “No determinations are being made at this time before the full suite of data — the full results — are in,” he said. Some scientists also worry that dispersant use is contributing to the underwater plumes, or clouds, of oil that researchers have identified in the Gulf. Oil is lighter than water and so normally floats to the surface, but the dispersant is designed to break the oil up into small droplets that are more easily digestible by microbes. But scientists are concerned that those small droplets are remaining suspended in the water column, and researchers know very little about how thatt might affect undersea life. Wednesday on the NewsHour, we’ll have more from scientists who are investigating the underwater oil plumes. In this video, Peebles shows how samples of water from the Gulf that look clear actually contain microscopic drops of oil. Peebles’ University of South Florida colleague David Hollander is investigating how that oil might be affecting the tiny organisms at the bottom of the food chain, and thus the entire gulf ecosystem. “Some of these continental shelf areas are home to very important marine protected areas […] The impact might not occur this year, it might occur four year life cycles from now,” he told the NewsHour. Watch the show tonight for more from Peebles, Hollander and other scientists investigating the effects of the oil spill.